Now you can integrate your Lead Manager with other Lead sources besides your Real Geeks Website. There is also a separate Round Robin configuration in your Lead Manager for these third party sources. Make sure you also check the lead assigment example below. The Lead Manager has built in integration with InfusionSoft where leads that are generated in your CRM will be shared with your InfusionSoft account. These leads will send to separate Buyer and Seller action sets where unique drip campaigns can be built. For more information and examples of InfusionSoft workflow, check out our InfusionSoft webinar archive with Greg Harrelson. To learn more about the InfusionSoft integration, click here. Every lead added to Real Geeks will be automatically sent over to Big Purple Dot. To learn how to integrate with this, click here. Click here to learn how to integrate with CallAction. Follow the directions in the lead router. First you will be asked to select your website. You can either create an account per agent or one for your team. Then it will show you your Real Geeks Realtor.com Email. You just need to set this email in your Realtor.com account to receive New Lead Notifications. We will monitor and read these emails automatically, and add the new lead to your Lead Manager as they come in. First you will be asked to select your website. You can either set this up per agent or one for the team. Then it will show you your Real Geeks Bold Leads Email. You just need to set this email in your Bold Leads account to receive New Lead Notifications. We will monitor and read these emails automatically, and add the new lead to your Lead Manager as they come in. The email address our system provides you with will need to be set within the landing page's settings in Bold Leads as a notification email address. 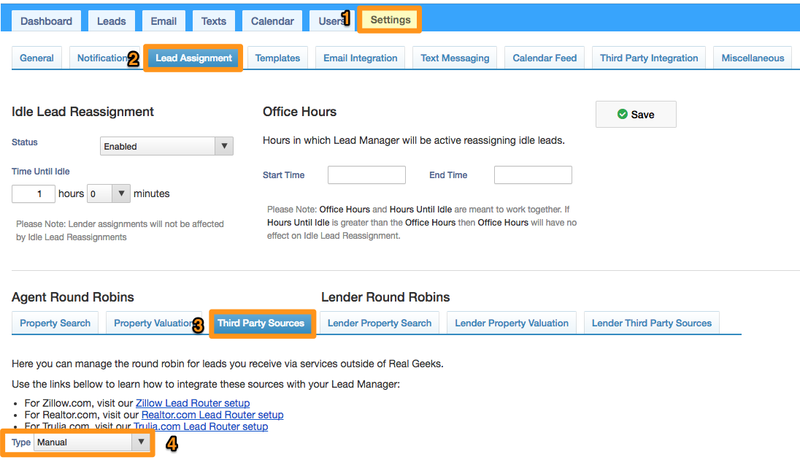 Zapier allows you to integrate hundreds of lead sources with your Lead Manager. This integration will route leads from your Real Geeks website, as well as third-party lead sources you have previously configured to work with your Lead Manager, to LionDesk. With this integration, leads that arrive at your website will be sent to both the Lead Manager and Wise Agent. Leads that are created manually by you in the Lead Manager will also be sent to Wise Agent. The Lead Manager can now be configured to send leads to Dotloop transaction management. The Lead Manager can now be configured to send leads to your calling groups in Mojo Dialer. Real Geeks can send leads to Riley and receive activity with the conversation Riley had with your lead. To learn how to connect with Riley, click here. Real Geeks can send leads directly to your Velocify CRM. Click here to learn how to integrate with Top Producer. 1. Click on the “Settings” Tab. 2. Click on the “Lead Assignment” Tab. 3. Click on the “Third Party Sources” Tab. 4. Select the Lead Assignment Type for these Leads (this will save automatically).